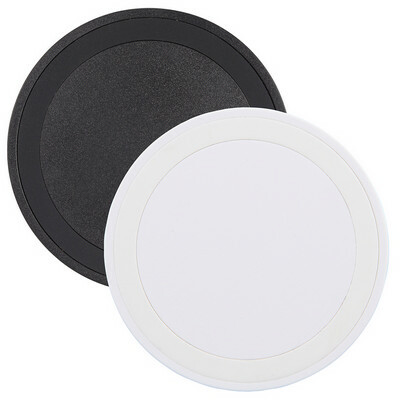 Description: The Wireless Charging Pad allows you to charge your smartphone without the cables. Supports wireless charging at up to 1A for devices including (but not limited to ): iPhone 8/8Plus/X *Samsung Galaxy Note5/S6/S6 Edge/S6 Edge+/S7/S7 Edge/S8/S8+ * Google Nexus 5/6/7 * HTC Droid DNA, 8X * LG G3/G4, Lucid 2/3 * Nokia Lumia 920/930 *. Input: DC 5V, 1500mA. Output: 5W Features: If want to charge an iPhone series before iPhone 8 with wireless technology, an external wireless charging receiver or receiver case is required. Packaging: Colour: Black Material: Product Size: 69mm(w) x 69mm(h) x 9.5mm(d) Freight details : 200 per carton, 11.8kgs, 44.5 x 43.2 x 23cms; Decoration Type(s): Colour Print / Full Colour Print Decoration Area: Print: 40mm(w) x 40mm(h). Price includes : 1 Colour 1 Position Print. Setup is included.